Welcome to the Assassination that Caused World War I Virtual Center. The first thing your group needs to do is read about the assassination that caused World War I. After you read, you need to work together to complete the Assassination Center Page in your Lesson Chronicles. In June 1914 Archduke Franz Ferdinand, the heir to the throne of the Austro-Hungarian Empire, was murdered by a Serbian student in Sarajevo. More modern thinking than most European royals of his era, Ferdinand was gunned down outside a Sarajevo sandwich shop while on an official visit to the city. The gunman was Gavrilo Princip, a Serbian teenager who belonged to a violent separatist group opposed to Austro-Hungarian imperialism. Within six weeks of the Archduke’s murder, the great powers of Europe were at war. In another time and another set of circumstances, the assassination of Franz Ferdinand would have caused outrage but not a declaration of war. But coming as it did after two decades of tension, within Europe generally and the Balkans specifically, the assassination was a flashpoint in history. It triggered a poisonous wave of anti-Serbian sentiment within the Austro-Hungarian empire. Austrian generals had long fancied a war of suppression against the troublesome Serbs; the murder of Franz Ferdinand – ironically, a man most militarists despised as indecisive and too liberal – provided them with a pretext for war. It did not help that Germany’s war hungry kaiser, Wilhelm II, urged tough action against Serbia, backing Vienna in the event of Russian intervention. Franz Ferdinand was the nephew of the Austro-Hungarian emperor Franz Josef, and had been the heir to the imperial throne since 1889. Educated in history and the classics, the archduke was intelligent, well-informed and more worldly than most (in the 1890s he had completed a ‘grand tour’ across three continents, which included a lengthy stay in Australia). Ferdinand could also be strong-willed to the point of stubbornness. An example of this was his determination to marry a non-royal, Sophie Chotek, against all advice from his family and political leaders; the marriage was approved but was morganatic, meaning that Ferdinand’s children could not succeed him as emperor. Ferdinand’s politics were surprisingly liberal: he believed that rights, freedoms and concessions to the empire’s ethnic groups might need to be considered; he also expressed the view that the growth of revolutionary movements in the Balkans was, in part, the product of Austro-Hungarian heavy-handedness. These views put him at odds with his uncle, the emperor, and Vienna’s conservative political and military elite. It also made Ferdinand’s eventual fate more of a tragedy, since he was one of the few men broad-minded enough to save the ailing empire. On June 28th 1914, Ferdinand and his wife were touring Sarajevo, then part of the Austro-Hungarian empire, now the capital of Bosnia. They were targeted by a small band of Serbian nationalists, who had been inflamed by Austria’s takeover of Bosnia-Herzegovina. No strangers to political violence, a faction of this group plotted to assassinate the archduke in the streets of the city. At 10.10am they launched their first attempt. Cabrinovic, a Serbian youth, threw a small bomb towards the open-topped car carrying Ferdinand and his wife – however the bomb bounced harmlessly off the rear of the car, then detonated beneath the vehicle following, destroying it and wounding more than a dozen people. Cabrinovic fled, swallowing a suicide pill then jumping into a nearby river; he could not even get that right, vomiting up the pill and landing in water that was barely ankle-deep. He was soon captured, while his collaborators watched as the royal car sped away. They slunk away into Sarajevo’s backstreets, thinking their opportunity had passed and the plan had failed. Little did they know then, but Franz Ferdinand interrupted his schedule to call at the hospital, to check on those wounded in the earlier attack. After leaving the hospital his car drove down the wrong street and ended up outside a sandwich shop. One of the assassins, Gavrilo Princip, emerged from the shop, having just bought his lunch. Princip drew two pistols and fired at the royal car: his first shot struck the archduke’s wife Sophie in the stomach, the second hit Ferdinand’s throat. Again the car sped away to seek medical help, arriving at the governor’s residence minutes later. Sophie died before she could be removed from the car; Franz Ferdinand was hauled inside but died on a chaise lounge minutes later. The murder of this comparatively popular royal incited a flood of anti-Serb protests and violence in many Austro-Hungarian cities, including Sarajevo itself. Serbian stores and buildings were vandalised and some suspected Serb nationalists were beaten up. Across Europe there was widespread shock at the murder, along with messages of support for Vienna and encouragements for her to take tough action against the terrorists. The immediate response of the Austro-Hungarian regime was to demand an inquiry into the assassination and those involved, to be conducted on Serbian soil by Austrian authorities. But the Serbian government rejected this, declaring that Serbian officials had no involvement whatsoever in the killings and that “the matter did not concern the Serbian government”. This precipitated the ‘July crisis’, a month of ultimatums, threats and bickering, during which the leaders of Europe advanced the case for both war and peace. Franz Ferdinand and Sophie were buried in a family castle in Austria, after a private funeral which no foreign royals or dignitaries were invited to (not even the German kaiser or Emperor Franz Josef himself attended). Gavrilo Princip and all but one of his associates were captured, interrogated by Austro-Hungarian authorities and placed on trial. Some were executed, however since contemporary laws prohibited the execution of anyone under 20, most of the conspirators were given 20-year prison sentences. 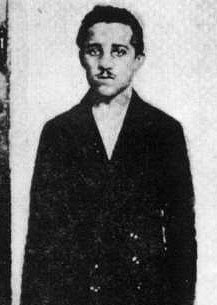 Princip was spared because of his age but he suffered terribly in jail, contracting tuberculosis and later having an arm amputated. He died in April 1918, six months before the end of the war he had helped instigate. The Serbian Black Hand had to assassinate Archduke Ferdinand because he wanted to convert the Austro-Hungarian Monarchy (the Dual Monarchy) into a Triple Monarchy by the inclusion of Serbia. Although the Serbs might gain a certain degree of autonomy within the Triple Monarchy, their long cherished wish of creating a united Serbian state would be dashed to the ground. Francis Joseph, the reigning monarch was eighty-four years old and expected to die soon. Ferdinand's ideas might have a chance for realization very soon. The Black Hand thought that they should kill Ferdinand before it was too late. Some members of the Serbian cabinet knew the assassination plot in advance but did not stop it. Austria considered the murder of the heir to the throne an open Serbian attack on the existence of the Dual Monarchy because if Francis Joseph died Austria would be left without an heir. Although she could not find any evidence that the Serbian government was connected with the assassination, Austria consciously exploited the occasion to destroy Serbia as a state to put an end to the Serbian threat to the existence of the Dual Monarchy for ever. A war with Serbia might lead to a war with Russia. Thus Austria wanted to be assured of German support. The German Kaiser decided to support Austria because he regarded Austria as the only ally of Germany and because he believed that the Russian Czar would not come to help Serbia in a war involving the death of a future monarch. On July 6, Germany assured Austria that should there be an Austro-Serbian war, Germany would stand by her (Austrian) side and give her unlimited support as an ally. This was called the "Blank Cheque". Serbia was to suppress all anti-Austrian (and Pan-Slav) publications, societies and propaganda. Serbia was to dismiss all anti-Austrian officials objected by Austria. Austrian police and officials were to enter Serbia and to take part in the Serbian police force in order to carry out the suppression of anti-Austrian activities and investigations concerning the Sarajevo murders. These demands infringed Serbian sovereignty. Austria expected that Serbia would reject, thus giving her the excuse to declare war. Serbia accepted the first two demands but rejected the third. Serbia suggested to submit it for arbitration by the Hague Tribunal. William II was satisfied with the Serbian reply and did not feel the need to punish Serbia with a war. He declared, "a brilliant diplomatic triumph, no excuse for war." Austria was still determined to destroy Serbia. After declaring the Serbian reply unsatisfactory, the Austrian government declared war on July 28. The bombardment of Belgrade began on July 29. The Serbian ally, Russia, learnt of the ultimatum on July 24. On July 26 the Czar reassured the Serbian crown prince that "Russia will in no case be indifferent to the fate of Serbia." Russia certainly could not bear humiliations from Germany any more; if she failed to defend Serbia again and again, Russia could no longer set her foot on the Balkans as the leader of the Slav nations. The Russian Czar was probably encouraged by the French to take a firm stand against Germany, for France had learnt of the Schlieffen War Plan . France urged Russia to mobilize for fear of an immediate German attack. After the bombardment of Belgrade on July 30, the Czar was persuaded by his ministers and Chief of staff to order full mobilization. Germany feared that she would face attacks from both Russia and France. Germany demanded Russia to stop her mobilization at once. Russia refused. Germany at once declared war on Russia on August 1. According to the Schlieffen Plan , Germany had to attack France at once. Germany sent an ultimatum to France demanding her to be neutral. After receiving a French reply that France would side with Russia, Germany lost no time and declared war on France on August 3. After the formation of the Dual Alliance between Russia and France in 1893, Germany feared attack on two fronts--France in the west and Russia in the east. The result was the Schlieffen Plan (this was the war plan for Germany during the First World War). The Chief of the German General Staff, Count Schlieffen drew up his military plan on the theory that Russia would need at least six weeks to mobilize before she could be ready to attack. In the meantime, Germany could concentrate her military forces against France, which might be subjugated within six weeks by an overwhelming attack through neutral Belgium. Germany could then turn to attack Russia. Archduke Franz Ferdinand was an Austrian royal, a nephew of Emperor Franz Josef and the heir to his throne. The archduke was intelligent, worldly and liberal-minded, which set him at odds with his conservative family. In June 1914 Ferdinand was touring Sarajevo, Bosnia, when he fell victim to a terrorist gang of Serbian nationalists. The assassins were young, nervous and clumsy but one, Princip, stumbled across the duke’s car. Both Ferdinand and his wife were shot in their open-topped car and died within an hour, while Princip and his collaborators were soon arrested. The murder caused outrage around the world.